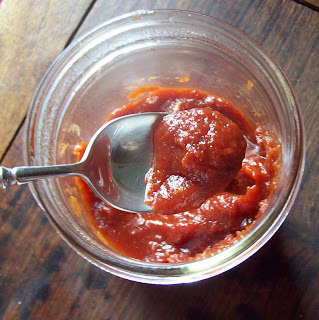 The Nourishing Traditions recipe for ketchup has intimidated me, so I was glad to find one without the addition of homemade fish sauce in the GAPS book. ~Boil above, uncovered (I covered with a sieve to prevent splatters) for quite a while, until it gets to the desired consistency. Easy! No corn syrup like supermarket ketchup, and it doesn't carry the health food store price tag. This summer if we get an abundance of home grown tomatoes again I hope to do a bunch of this from fresh tomato juice. Are you using coconut oil in your cooking yet? Soaked Wheat Bread: It doesn't have the dryness normally associated with wheat bread. Make in just a few minutes of hands-on time. 0 Response to "Easy Homemade Ketchup"